The world is in danger and it needs your help. For dozens of years, advanced robotic technology has been researched underground. Scientists have thought that a new age nears and robots will be the key to humanity's freedom. Now, the time has come for a brave person to unravel the secret and design the ultimate robot. What you must do is construct a hero of iron who will save humanity and lead the path to victory. To your aid you have the product of years of research – advanced, beautiful and functional body parts that are the foundation of an ultimate machine. How will your savior robot look like? Do you have what it takes to compose a true hero of iron? 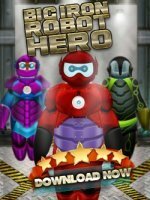 This Big Hero 6 inspired app is a dress up game with a wide variety of cosmetic choices and built-in social sharing system. As humanity is under fire and relies on a miracle to see the world saved, it is up to you to design the robotic champion. Assemble an outstanding machine using different body parts and show the others what you are capable of. How to play this Big Hero 6 Inspired Game? “Big Iron Hero Robot” is not a competitive game. Instead, it gives you the freedom to design your own robot by combining different body parts. It focuses on inspiration, visual appeal and a bit of abstract thinking. Basically, you are given a robot template with various customizable body parts. 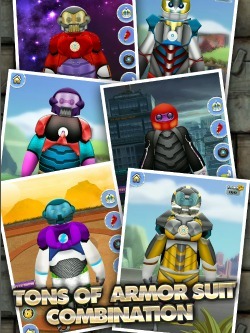 You can customize the design of the robot's armor, mask, gloves, pants, top or shoes. Additionally, you are given the chance to change the design of the robot's proud Emblems. “Big Iron Hero Robot” also provides players with the ability to have a different background, changing the scene of action and setting a completely different mood to their robot design. 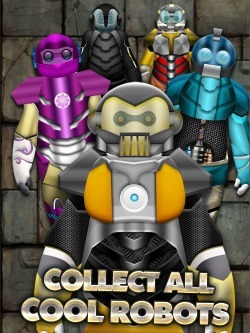 A special side to “Big Iron Hero Robot” is its distinctive coin system. Coins are used to unlock random locked items which are both rare and precious in value. You can unlock those secret items only randomly and for the sum of 10 coins. 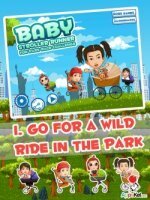 The game encourages exchanging of ideas by the players and has a strong social side. There is a rating system present which lets you rate other players' robots and get your own creation rated by others. This is the way to decide which robot is the true champion of humanity. You can share your robot design to your friends via either social media (Facebook or Twitter) or by e-mail. 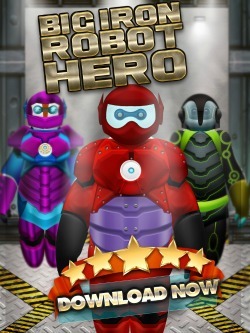 While this Big Hero 6 inspired app is a free game, a small fee can be paid in order to unlock locked items or unique robot designs. If you wish to disable in-game ads, you can also do so by paying a small fee.